Why do you need a power meter? Because you realy really do. Having been using power now for 9 months, I have had a good chance to have a look at how the information can be useful. The weekend just gone by was my first opportunity to properly do some form of a target time trial over a semi reasonable distance to get an idea of potential pacing for races. My strategy was to keep the power between 250 and 300 watts and every 15 minutes, get ot of the saddle one gear harder to stretch as the course can be ridden seated the whole way around. I got a little excited in the frt hour and was probably a little heavy on the power opver 300 quite a bit but settled into the gal bracket from there fairly well. The graph above has some smoothing applied to show averages over 4 minute blocks for a general feel. The untouched version has pikes out of the range in each direction here and there. I really wanted to see the trend over the time. The parts on the graph that are most helkpful are the purple line and the yelow Purple is Torque and Yellow is Power. At a glance, the Torque remained the same and the power remained in the bracket (and above in the first hour). This tels me that the bracket chosen was able to be held for the duration required. Being on the road bike, I would have somewhere around 8-10 seconds/km to be gained on my TT bike (maths based on CdA) so something like 10-11 minutes which aligns with my past performaces over those distances (2:09 actual on raod and projected to 1:58/59 on TT bike). Re: Why do you need a power meter? Thanks for sharing the workout and giving us some info to base some of our own training on. I havent got a power meter, but would love to have one for this exact reason, being able to really gauge work done rather than perceived effort or HR. I wonder what year they will drop to a price where they cost less than my bike. I cant justify spending that amount of money as of yet. Should i just upgrade the bike so that the Power meter costs less than the bike. $659 US for a wired PT Pro in a DT Swiss 1.1 wheel. Alex R wrote: $659 US for a wired PT Pro in a DT Swiss 1.1 wheel. Thanks for that. I see the wireless option is another $540 odd bucks and it seems you cant buy it without the head unit (the thing on the handle bars) ive got a 310xt so i really wouldnt need it, or would I? You really don't need the wireless one. It will work with your 310 though. If you are going to spend the extra dollars, try Wheelbuilder for theirs as you can buy them without the head unit. If I read it right, you can get a wireless DT Swis Elite PT hub in 32 spoke for $950ish US. The hubs go in order of Elite, Pro, Sl. The only real difference is the weight which is for the hub only, 624, 466 and 416 grams. I have Pro for both as I can't see any value in the extra cash for the SL and in reality, there is probably no measurable value in the step up from Elite, much like 105-Ultegra-Dura Ace debates. Oh, and you HAVE to get WKO+ from training peaks as well seeing you have the 310. It is about $100US right now. I'd be curious to see what sort of numbers you would produce with your powermeter covered. Loved to know how well athletes can calibrate their RPE to produce good outcomes like you have above. Any chance you getting you to do the same TT in as samilar conditions as possible, but without being able to view the data as you ride?? What I do know however is that it is extremely easy to push watts 50-100 more than what you want with very little noticable difference in effort in the short term. hese are all above threshold power and like I said above, add them all up and you can have a large amount of time spent above threshold. I did the vast amount of my cycling over the last year by not paying any attention to the meter and on these rides the VI or variability index would be quite high. This is fine for cycle races but long course triathlon, the lower the VI the better. The VI is the difference between you actual average watts and a calculated figure called Nornmalised Power which is sort of a figure that takes out all the zero power/freewheeling and stops etc. How about shorter TT's, for example, one day knock off a 20km TT at IM effort with the powermeter covered and then a few days later do another 20km TT with the powermeter open for viewing. In all honesty it can only confirm how much better it would be to have a powermeter, that is though, only on the condition your are not able to execute well according to your RPE. This the only bug bear that I have with powermeters. They definitely, prove how easy it becomes to execute and pace correctly, but I'm not convinced we don't have the ablility to do it just as well without one. I firmly believe with your experience you can still TT t produce a low VI wihtout a powermeter. I even believe you did exactly that with your 9:45 at Busso. So I'm not convinced we need to spend that much money being able to learn that skill, which can be taught just as well through specific sessions that will meet the demands of an event. It's great to look at the numebrs to confirm, what I feel, is what you already know AND more importantly can already do. People that continually screw up their pacing in races would be a prime candidate for a powermeter, but even then they will probably still struggle with the mental arousal aspect of racing. I can't see that as a problem with you, you execute well, maybe not Port, and you have the discipline and knowledge to maximise your training, I can't, yet, see how a powermeter is going to make it better for you. Unless of course, your doing training sessions, and then looking at the data, thinking you executed well, but in fact screwed it up. Even if that does occur it doesn't take to many specific sessions to rectify that problem. When you decide to spend that much money on a training tool you need to develop a critical awareness of what it is you want to get out of it. Just as a general question, looking at your graph, what's your next step? your next progression to get you to the next level, that can only be achieved with a powermeter. it is a very interesting question, are powermeters just the latest 'buzz' word that will be phased out just like HRM's? I train with a computrainer and use it only for threshold sets in its ergo mode.. I have not bothered with a powermeter on the road yet as I also dont see the point.. I see no benefit for the vast majority of road cyclists either. There is no question that for a pacing tool in a flat cycling event such as a triathlon where you need to deliver yourself in some form of shape to the end of it to run, they are amazing. As per Fluro mentioning my Busso, it was essentially exactly the same as running power how I executed that one. I glared at my watch and held a heart rate down to a couple of beats for the entire thing. Being so flat, buso is easy to do this. The proof in the pudding is that I did exactly the same thing at Port with exactly the same heart rates while much fitter and blew to pieces. As Port is hilly here and there, the heart rate drops say 20 BPM and you can really push too hard wile it comes back up. With power, an individual wuld just hold the ower zone while at the lowered heart rate and the BPM will gradaly increase That bike leg at Port was probably the main catalyst for me buying Power. As for training and improving, that is a whole other subject and one that mch already exists for. Anthng you can do with RPE or HR you can do wth power bt mch much more accurately I will dg up some power rahs of hill repeats I have done and I dare anbody to be able to repliate them by using RPE or HR. Delivering yourself in some form of shape is definitely the key. In terms of pacing, key specific sessions will yield an honest awareness of what you can expect to comfortably hold in a race. For example, you can’t rely on high intensity 2hr rides as a means of setting up a pacing strategy for 180km. Ultimately getting out there and doing 150-180km race sim ride, below, at and above race pace efforts to me will give you all the feedback you need. I think sometimes powermeters can put unnecessary caps on how you execute your race day plan in order to maximize your potential on the day. By relying on the numbers you begin to lose strategic moves that can play an important role in assisting your overall performance. So much goes on under race conditions that if we ignore some signs and signals and try to race to a number we could in fact get to T2 in a worse state. If you’re FOP you may need to ride harder at the start for positional and tactical reasons. Bulldog talks alot about this and he races this way to tactically hurt is fellow competitors that are “whippets” and run much faster than him. Tactically he raced to his strengths in order to protect his weaknesses. As a result he had a 6 minute lead over the entire age group field going into T2. His first 40km split was 39.9kph, and his last 40km split was around 35.5kph. Whether or not it worked we’ll never know, but it is just one example, of a strategy that needs to form part of a race day plan. This is all dependent on what happens on the day and being race savvy and making adjustments. Those adjustments are like, secret weapons that should be brought into play according when the best time is to unleash your strengths. In training I think HR monitors, GPS, powermeters, and foot pods are great tools that should be used to solely calibrate your RPE. Your RPE will provide with the weaponry to race to your potential. Having a well calibrated RPE will allow you to know exactly how hard to train, how often, when to back it off, when to do more, etc..... which all form part of essential racing skills. At times we use the training tools while unknowingly we detrain our skills(5 senses/RPE) and intuition(fight or flight principle), because we solely rely on the numbers without thinking about the environment we are in that effects those numbers. The tools just don’t read those environmental factors that are critical for success. I tend to use this example, if we type away on the computer; the spell checker will quite often correct our spelling mistakes. Fortunately, we end up writing with very few spelling mistakes; unfortunately, we don’t learn essential spelling skills (training), which then hold us back when we try to put pen to paper(racing). The spell checker is not transferrable, just like training tools, if used incorrectly we are losing out on skills that are needed on race day. It reminds me of the movie "A.I" (artificial Intelligence), computers will never outsmart the human brain. Personally I feel the ultimate training tool is your 5 senses (look, listen, feel, touch, smell) and the fight or flight principle, which should be aligned with your RPE. Your senses have the ability to pick up on things way before they happen, which is more accurate then measuring things as they happen. This gives you, the athlete, time to process what is about to happen and make the best judgement call (fight or flight) well in advance. I can remember when I raced in Germany and I relied on my HR monitor to pull back my efforts in the first 60km. How uneducated am I having to rely on a tool to execute my race plan. To me that is sub optimal, probably due to over relying on my HR monitor in training, and not setting up specific training sessions to develop a critical awareness of how the effort should feel in that first 60km. It becomes a recipe for disaster, and a sub optimal performance because I lacked to confidence to execute a race plan and I ignored the conditions on the day. I personally feel this cost me time. If I don’t know what easy enough is before I get to the race, then how can I possibly expect to race well?? How can I possibly know when to race to my strengths according to the conditions I’m faced with on the day? I didn’t because I stuck to a number, which overlooks too many other race day factors. Not 100% convinced about this. As triathletes we learn with experience to master the levels of effort through swimming, cycling and running. Looking at your graph above, it’s an excellent result, but I’m just not convinced you couldn’t achieve the same outcome without a powermeter. Even before you opened the file you probably already knew you had nailed the session, and produced a low VI. This is because; you already had those skills before you went into the session. It doesn’t take too long in the pool to accurately learn how hold a certain pace right down 1-2sec/100m. Likewise with running we learn how to accurately find and hold our min/k paces. We can calibrate our efforts so accurately while swimming and running I can’t see why we can’t master that same level of competency on the bike. In fact, I think we do. However, I feel powermeters are heavily marketed on the premise that we can’t. Once again, it’s those external influences that powermeters don’t read, that have greater impact on how we execute according to effort. The challenge of being able to use a powermeter, I believe, will lie in looking beyond what you already know. These tools need to serve a superior purpose in defining where it is you need to be heading and how it is you intend on being able to get there. In terms, of defining you level of effort, I don’t think they are superior to RPE, purely because they are too 1 dimensional in what they are measuring. The powermeter guys, always argue that HR monitors are effect by the heat, fatigue, stress, nutrition, dehydration, etc, but is that such a bad thing?? These are the variables that influence our efforts, so I'm not sure why powermeters would discard these variables and then claim to be a more accurate measure of effort?? Does that make sense? Before we get too confused with each other's point, let me state that I am not saying that RPE or HR training and strategy can not get the same out come as using electronic devices. Wat I am saying is that having done al3, there is absolutely no doubt in my mind that the information that a power meter in particular will show you has it over the other two. The use of power need to be an all in. There are many who just have a very expensive bicycle computer that hapens to show them power and it reads to me that that is how you see them Fluro, as a number on a screen. There is so much more to them. For some examples Quadrant Analysis, FT and the relationship to power out puts for all distances of racing, Normalosed Power, VI, TSS (TRaining Stress Score, this one is a ripper), CTL (Chronic Training Load), Instantaneous effort zone ranges and a bucket load more. The kicker to al of these is that you need to do nothing other than plug in your head unit an downloa it and you have all of this information at a glance and al of it is worthwhile in constructing 180.2km of appropriate riding to maximise your last 12km of an Ironman from the 30km mark of the run to the finish line. You asked me to do the 80km TT again and put up the graph again. I really don't want to waste a session ike tht but what I will do is to go out and run my HR up to 150 or so then do a few periods of work where I will keep the HR in a 5BPM range over say 10 minutes but show you the enormous difference the Power graphs will show. This is my whole point. Any time spent above threshold in an Ironman is suboptimal. Every time you do it, they add up and to get from 9:40 something down into the 9:20s, it is not so much a case of 'feel'. I think high 9s can be done by smashing a heap of training but it is the fine tuning that takes that next step. No you have my interest ;-), I'd interested to hear how you are going to use the information, what will be your next step? Like I said, look beyond what the numbers say, and show what you can do with those numbers? How do you process the data, using all of those metrics to structure you future training sessions based on those metrics the powermeter has provided you. I'd be keen to know what sort of sessions you would come up with to build on that 80km TT or training sessions based around developing a better 80km TT result. Exactly the same way you would do it with RPE. Load and overload and recovery. Instead of cycling comfortably hard, I would ride at 300 watts. Instead of taking every 5th day off, I might do something like take a day off after a total TSS of 800 or when my CTL gets above a certain point. (these are just off the cuff examples)The training 'science' is no different just the metric used to quantify the effort. You can paint the same wall with the same paint using a 30cm roller or a 3mm artists brush. The proof of the pudding will be if you are painting a plain colour or a portrait. fundamentally i have a problem with the concept of pacing the bike leg from the powermeter. what if your having an amazing day and your powermeter limits your performance. In my opinion if your (i mean any of us mere mortals) going to qualify for kona were going to need the race of our lifes.. you have to race on the red line. having a powermeter can only limit your performance..
GRAH! I had typed a lengthy post and it died. Who runs this friggn site? 1. I am talking Ironman. 70-75% of FTP. This is nowhere near Red Line. 2 For Agers it is not a race, it is a time trial and this is the same for all of them Hawaii qualifiers included. An Ironman is constructed and executed, not played off the cuff on race day. 3. Taking any form of risk on the bike is absolutely idiotic if wanting to run to your potential in the marathon. 4. Faris and co are finishing 60+ minutes ahead of the fastest AGers, comparing us to them is an exercise in futility. I am going to get a graph up this arvo. Just gotta go and do the ride to show what I am talking about. Real quick, before I go, add any test you want otherwise I am going to do the follwing. I picked 150 BPM as ths is the lower end of my long range cruise heart rate zones and is a rate I do quite a bit of LSD at. Things I wil be looking for are average watts, Normalised power, Variability Index, Distance covered in 5 minutes, time spent in each training zone as per Coggan power levels, max, min and average HRs. Course will be the same stretch of road with a U turn after 5 minutes, steady back to start, turn at roundabout then repeat. Looks like it will be in about a 15km/hr cross wind at the moment. I leave in 30 minutes. The intent is to see what varying intensities produce V sustained effort and how my RPE stacks up against power zone V all out effort. Alex R wrote: You really don't need the wireless one. It will work with your 310 though. If you are going to spend the extra dollars, try Wheelbuilder for theirs as you can buy them without the head unit. I ended up doing it slightly different as the 5BPM range was way too small after thinking about it. What I did was to use a steady 150 BPM, a Steady 215 watts which is about 150 BPM for me, three runs of start at 145 BPM and go up to 165 BP which is 1 beat above my 'magic heart rate' which I have worked out over the years is my sweet spot for endurance. The three runs were 1. RPE moderate effort 2. Watts Zone 3. All out. The way I see these they simulate a section of undulating road where you ride up it by feel, ride up by in a power zone then attack the hills. I didn't have any expecation of any particular outcomes and while I type this I still have not looked at the figures but here they are...... Al tests performed seated on a road bike hands on the hoods. Tests 3-5 were performed into an aproximately 10km/hr head wind and test 1 and 2 were performed with an aproximately 10km/hr tail wind. Test 3.Start 145 BPM and increase to 165 BPM va RPE described as moderate. A very quick summary is that all 3 had very similar average power, all 3 covered a very similar distance but all 3 had very different variations in output to remain within the heart rate target bracket. The watts target zone that I picked I know will level off at about 170BPM which is about what I would ride a Half Ironman at. The RPE of the first part of the graph above was done at what I would chose to ride a half Ironman at. The graph shows quite a bit of time spent above 377 watts which is my threshold power for the first and third sections (test 3 and 5) and no noticable time above theshold for the second section (test 4). The shae of the first part of the graph is very similar to hill repeats that I have completed in the past when not watching the meter. Hill reps completed when watching the meter show a dead flat yellow line much like the second part of the graph. Intensity Factor is simply the ratio of the normalized power as described above to your threshold power. Training Stress Score (TSS) is a way of expressing the workload from a training session. It is the product of the workout’s intensity and duration. As either of these increases, TSS also increases. So, the lower the IF and the lower the TSS the better for the Ironman ahlete to achieve the same outcome distance and time wise. After thinking about if for a day, it is an interesting test that I didn't really know what was going to show. What is obvious is that for me, a pacing strategy via a power device gives the same steady state outcome as pure heart rate in terms of average hearyt rate but the power variation is far less with a pure power strategy. For flat track time trialing, this has further cemented that I will use a power stategy for my next race. In addition, seeing as I live in a purely flat area, zone specific intervals will be far better completed with power usage. Take from this what you will. Comment/Critique as you see fit. alot of it is gobbledegook to me. Alex, im so confused with thresholds. Is the 377 the max you can hold for how long? This is kinda sorted related to power. Move it if it doesnt fit in here. Today I did a VO2 Max test on a ergo fitted with a SRM. It felt very weird and i should have spent the time to set up the machine to my specs but i did the test. I had to fast from 10pm the night before. The test was at 12pm. 6.5 km swim the day before. 5 hours sleep. first 20 minutes was a warm up stepping up every 5 minutes to a max power of 210W. then a 5 minute rest at about 110W or something. then 1 minute steps going up 30W each minute starting at 130W. I tapped out at 400W. The room temp was 26 deg C and 40% humidity. these were the splits 1 minute each. recovery 110 5 minutes later after cool down. It got hard really quick, i was sweating a heap, no fans, i was wrecked whilst on the machine but recovered well. Having Power so easily displayed really shows how one can burn matches quickly, at times the power would jump easily by over 100W without me seeming to do all that much more effort. To reopen a interesting debate regarding the 'why do I need one' As I just dont see the 'need' part. interesting Yes, but 'need' no. 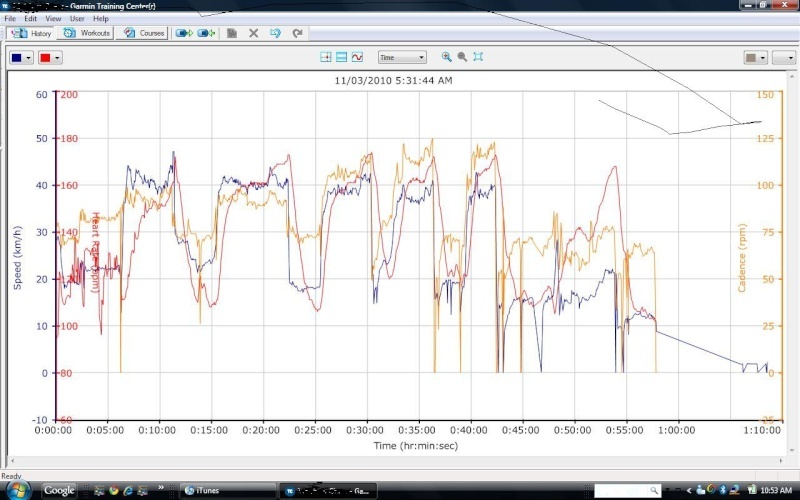 I am a big user of my computrainer and am literally in love with erg videos (forces you to output a set power when designing the ride profile). sometimes ill do sets in standard pro mode where its replicates riding on the road (ie more speed = more power. This is my garmin data from doing intervals from last week and this morning in pro mode. from memory this ride was up a 0.2% grade with max TT efforts including a sprint finish. 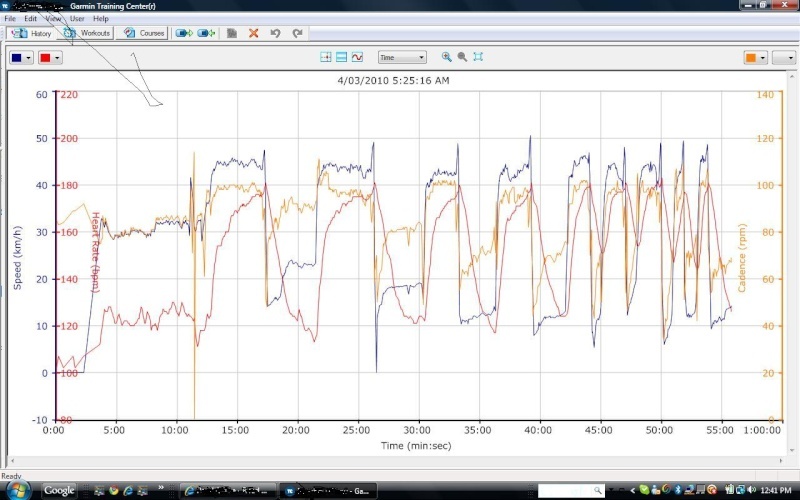 average power output over these intervals were all between 380-395 watts excluding the sprint. was having a good day, felt very good. This morning did a similar set along a slightly different profile with a climbing set at the end up 6%. Q) If i was to race today and only use power as a guide. where would you set my 'race pace' say for a 5 min interval TT etc? A) how could you? it will either be to high or to low..
A2) Use percived effort, use power/HR to log how you went.